Apple has unveiled a second generation of its iPhone, with support for faster 3G wireless networks. The company is hoping to boost its share of the smartphone market, which is dominated by Nokia and Blackberry. The new devices were launched by Apple boss Steve Jobs who said the phone would be "more affordable" for consumers, starting at $199 (£100). The new iPhone also comes with GPS satellite navigation built in for location-based services. The iPhone was first launched last year and was criticised for its support for slower 2G networks only. Mr Jobs said the 3G iPhone was "three times faster" downloading content over a mobile network compared to the original device. Analyst John Delaney, research director for consumer mobile at IDC, said the iPhone 3G was disappointing. "To me it's more about what they didn't say, than what they did. Everyone knew it would be 3G and have GPS." Apple has a 20% share of the US smartphone market, but only 5% worldwide. Rival handset manufacturers have also been designing devices which assume the iPhone's mantle as the "most desirable phone on the market", including Nokia's N96 and the Blackberry Thunder. Google's Android platform will also hit mobile phones later this year, adding yet more competition to the high-end consumer smartphone market. The big talk in the corridors of the Moscone Centre was about the new lower cost of the device. Apple has sold more than six million iPhones since the device debuted in the US in June last year and the firm says it is on course to sell 10 million by the end of 2008. 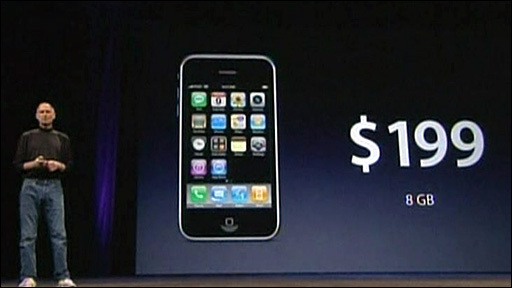 Mr Jobs said the cost of the original iPhone was the "number one reason" that people had not bought one of the devices. Mr Jobs said "The iPhone started at $599. It now sells at $399. We want to make it even more affordable." 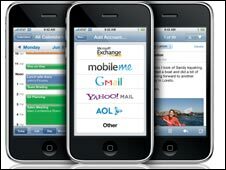 The cheapest 8GB iPhone 3G will sell for $199, while a second model with 16GB of storage will sell for $299. Mr Jobs pledged that the $199 price would be the same across many countries. The new iPhones will be launched on 11 July in 22 countries, including the UK. In the UK, mobile network O2 said the iPhone would be available for free on some contracts, starting at £45 a month. The carrier said the phone would also be available to pay as you go customers but it did not disclose pricing for calls and data. Reaction to the new 3G iPhone from developers and media at the conference in San Francisco was broadly positive, said BBC technology reporter Maggie Shiels. Henry Kannapek told BBC News that the $199 price tag would be hard to resist when the phone hit the shops. "It's tremendous. It's an incredible price. It's the best mobile device I have ever seen. I've got some cheap cell phones and I want to buy one of these." Developer Chris Cooksey of Wimba said Apple would score big with such a low price point. "It's a great price. They have made huge improvements to the phone and the fact that you can do third party applications rules." Mobile developer Robert F. Farnum, of Boingo.com, told BBC News he was all set to splash out on the new device for his family. "I've got six people in my family that need to get one so I just sent them all e-mails saying they have to buy it. The price just blew me away and the software is amazing. It is the best phone on the market." Michael Arrington, of the influential blog TechCrunch, said: "I was pretty excited by what I saw but I was hoping for a thinner model and a front-facing camera. But I think with the 3G speed and the price point it looks like a winner." "If Apple is doing it by cutting the retail price, it will drastically hit their margins if they sell volume. "If the lower price is through operator subsidy, they are becoming a bit more humble. But that's not clear at this stage. "Either way, they are going for volume. But they have got a big mountain to climb outside of the US." Do you have an iPhone? Are you planning to buy the new model? Are you at the launch? Apple made it easy for me to return to Mac with the ability to run dual OSs, but I'll have to stay with my i-760 PDA until Mac moves into support by more than one wireless phone provider. I'm a business user and not sold on a music/TV market model. I am waiting for an iPhone has a more realistic storage capicity. iPods themselves are capable of 160g or more. To claim a phone replaces your Ipod with only 16g of storage is not an intelligent marketing strategy nor intelligent purchasing. My goal is to downsize the number of electronics i carry, not have to consistantly switch out music and information that my current Ipod already holds. The iPhone won't be an option for me until it is available on pay as you go. Wow. Stevie finally finally gets his act togetether¿ the iPhone moves from being a "toy" to a real communication device... all thats left now is to open up the software to third party developers. Kudos Apple....welcome to the big time! This is absolutely disgusting, I had to dish out about $399 for the iPhone 1.0. I got a sub-par phone which incidentally I had to replace two times because of quality control issues at Apple. Now they release a 3G version that is substantially cheaper, I am more anti-Apple than ever. Scandinavia's Macophiles have waited a long time. Please hurry - or some of us might defect. They've listened to the consumers, and responded! I've loved my iPhone (1st gen), though agree it's not for all; but the new model has wider appeal, and will push the competition (and innovation). Of course, the nay-sayers are probably gearing themselves up to complain about something else now - probably the camera, or the fact that it doesn't make espresso. Two weeks ago I paid $299 for an iPhone and now the 3G will be available for $100 less. There is something wrong with this picture, Apple! On top of this, the iPhone doesn't support Hotmail or MSN email accounts!